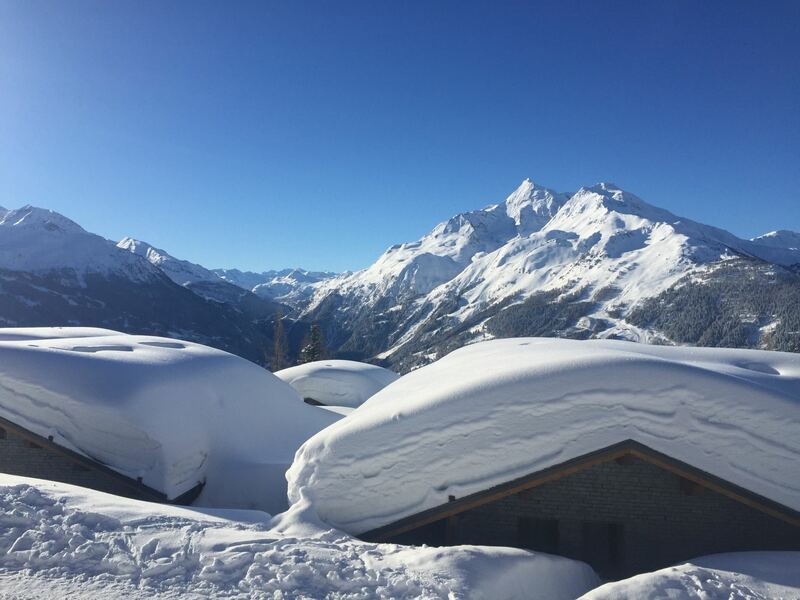 Set high above the Tarentaise valley La Rosière is a traditional style ski resort which enjoys stunning views across the Isere Valley and across to Les Arcs. It has the benefit of being sited on the sunnier yet still snow-sure southern side of the domain. It's south facing slopes give it the reputation as one of the sunniest resorts in France, while it's altitude and snow making facilities ensures guaranteed snow cover December till April. La Rosiere is renowed for being a warmly welcoming, family-friendly, good-value alternative to the bigger, brasher, more crowded and more expensive nearby mega-resorts of the Tarentaise. 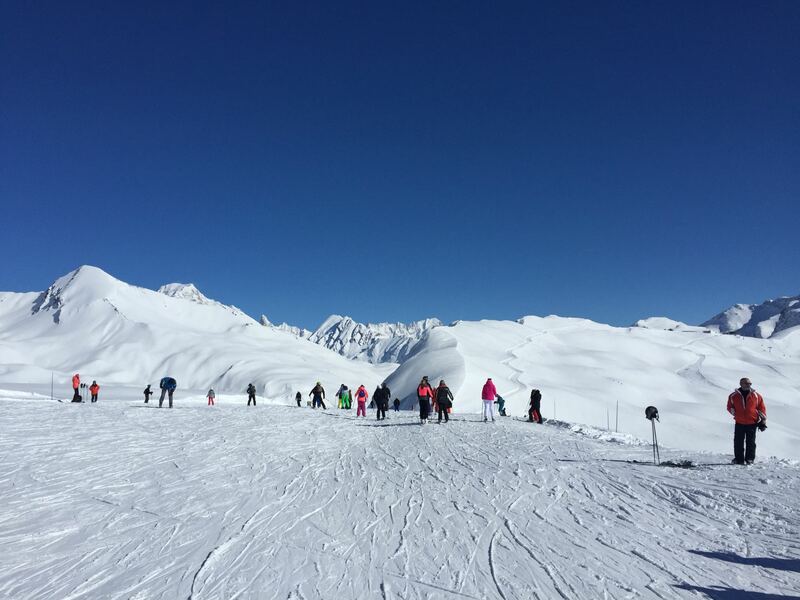 La Rosière is one of the friendliest of the Tarentaise resorts and ideal for families and improving intermediates. La Rosière ski resort forms the French half of the cross-border Espace San Bernardo ski area, linked with the Italian ski resort of La Thuile. Espace San Bernardo has 160km of pistes at an altitude range of 1850 to 2650m and straddles the Petit Saint-Bernard pass, which means that it benefits from early, high-altitude snowfall. The ski resort of La Rosière is perched in a high-altitude position on the sunny south-facing northern flank of the upper Tarentaise Valley, looking directly across to the ski resorts of Les Arcs and Villaroger that lie in the Paradiski area on the opposite far side of this famous snowsports-rich valley. The majority of the ski area lies above the tree line, on the wide and open slopes directly above the village, stretching up to the north along the lengthy spine of a ridge that runs down from the border with Italy. Both La Rosière 1850 and Les Eucherts have safe and easily-accessible ESF ski-school areas, from which novices can progress rapidly. In the secteur Rosière there are accessible novice areas and lots of great blue-graded cruising opportunities. The home area boasts surprisingly long and gentle runs on the French side. The ski slopes are reassuringly-wide, most face south and are served by smooth, modern chair-lifts. So ideal for younger children and for beginners. The nursery slopes in the centre of each part of the resort are great for young children as they are sheltered from the main ski area. Once the basics have been mastered the slopes here are wide and many of the greens and blues offer gentle runs to get you quickly to the next level. Three free lifts means that you don’t need to buy a lift pass until you are ready to head up the mountain. La Rosiere has been building its reputation as a great family resort over the past few years and the easy wide runs and leisure facilities in resort are testament to this. La Rosière’s skiing is predominantly intermediate terrain. Challenging reds include the Fontaine Freide which drops right down to 1176m between trees to the Ecudets chair. The Red Marmottes run down to the Marcassin chair is also very enjoyable with easy and more challenging parts. Above Les Eucherts village things are more varied, with blue and red runs, most of which drop towards the Combe des Moulins below the 2383m Col de la Traversette. More experienced intermediates, though, will head off to Italy in search of fresh challenges, new surroundings and often better snow quality. 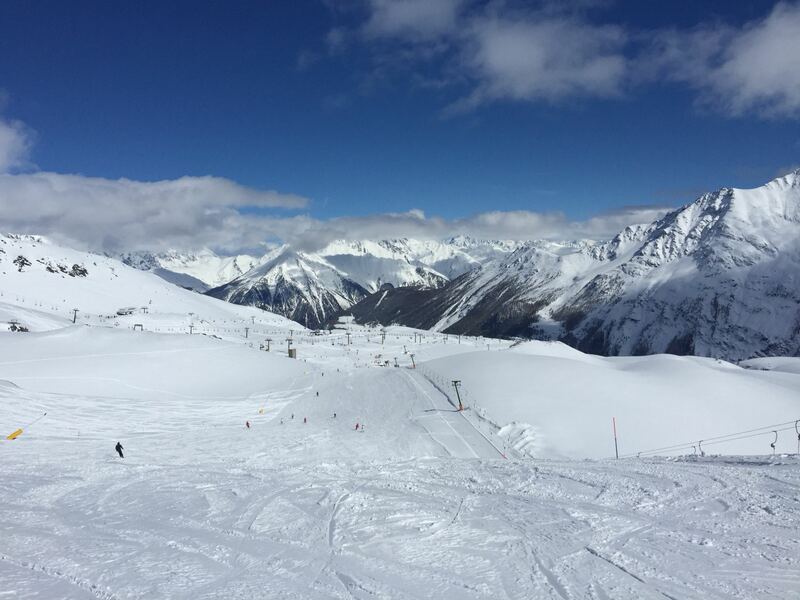 The skiing on the La Thuile side is worth the expedition, as the slopes go lower on to tree lined runs rather than being almost entirely above the treeline as they are at La Rosière. Runs are up to a remarkable 11km long and back. On the La Rosière side there are numerous wide fast cruising runs on the open sunny slopes. Only beginners should really hesitate to take the trip over to Italy, though to reach La Thuile you will be taking at least a few red runs. For those who like to go all the way from the top to the bottom, try tipping over into Italy at Mont Belvedere & taking the Ponteilles red run (no 18 on the map) then the Nouva (6) right into town. A vertical descent of around 1.2km, often quiet and very beautiful, you start exposed on the mountainside but soon plunge into the trees. Don’t linger in La Thuile too long, you need to make the last lift at 15:00 (do check the time when you get there!) to avoid staying the night or a long taxi ride back. 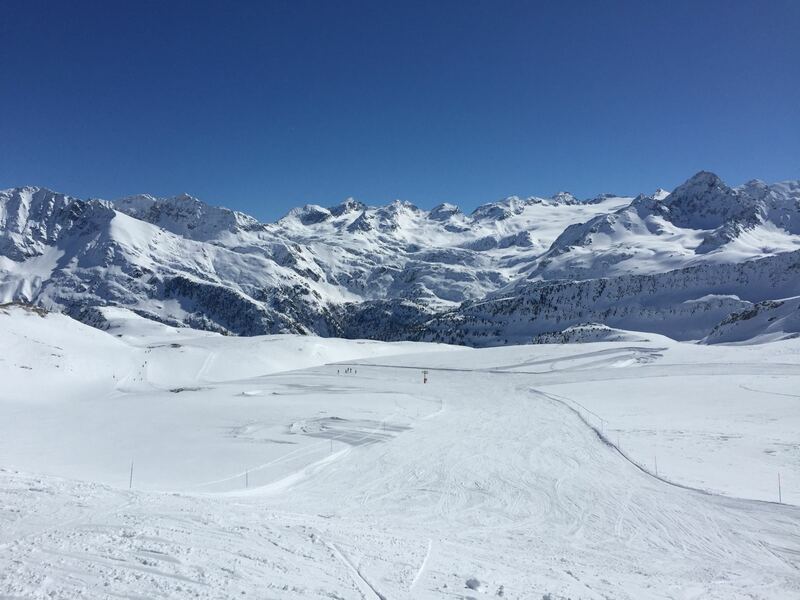 Experts do have a choice of more than 15 black runs across the circuit and the mountain guides office or ski school will be happy to show you numerous challenging off-piste routes too – so essentially there is in fact plenty here if you’re prepared to look for it. The toughest run is arguably the Franco Berthod piste, more than three kilometers (two miles) long. The resort’s steepest run plunges at an impressive 72%. There’s also plenty of off-piste, to which cross-border heli-skiing brings near-instant access. Apres ski and nightlife are generally quite low key, with just a handful of bars in the central part of the village plus a couple out in the suburb of Les Eucherts, but there are a couple of fairly lively venues amongst these, La Roz and Petit Danois in particular, plus there's a popular late-night disco-bar - Moobar - open until 4am. La Rosière is easily accessible from Bourg Saint-Maurice, which has good onward road and rail connections. Eurostar’s ski train runs directly to Bourg Saint Maurice from London St Pancras leaving every Friday night and Saturday morning. The Friday evening departure travels through the night arriving in Bourg Saint Maurice at around 10am the next morning. From Bourg there are buses directly to the resort. Chambery airport is at 1.40h distance away from La Rosiere.